Worktops come in a huge range of materials, thicknesses and finishes. Make sure you choose the best combination for your needs? Your choice of work surfaces will have a huge impact on the look and feel of your kitchen as well as its functionality. When considering what type of work surface to buy, it is important to realise how much a worktop endures from daily use, says Neil Shah of Stone Masters. It’s vital to choose a material that is hardwearing and durable whilst still maintaining an aesthetically pleasing appearance. Choosing a worktop that brings quality and practicality will also secure long-term benefits by adding value to a property. Granite, marble and limestone offer a natural look, which is perfect for both modern and traditional kitchens. The beauty of stone is that it is naturally quarried, meaning there will be a variation in veining so no two slabs are ever the same. Choose from different textures and finishes, from high gloss through to honed and leathered. Combining material finishes is becoming increasingly popular, explains Jeremy Jones of F Jones Cleveland. It’s not that expensive either as prices start at £150 per square metre for a 30mm thickness. Granite is exceptionally durable and is much more heat- and stain-resistant than marble and limestone, which require regular sealing. However, all stones will mark or chip if hit hard enough so make sure you use a trivet for hot pans and chopping boards for food prep. 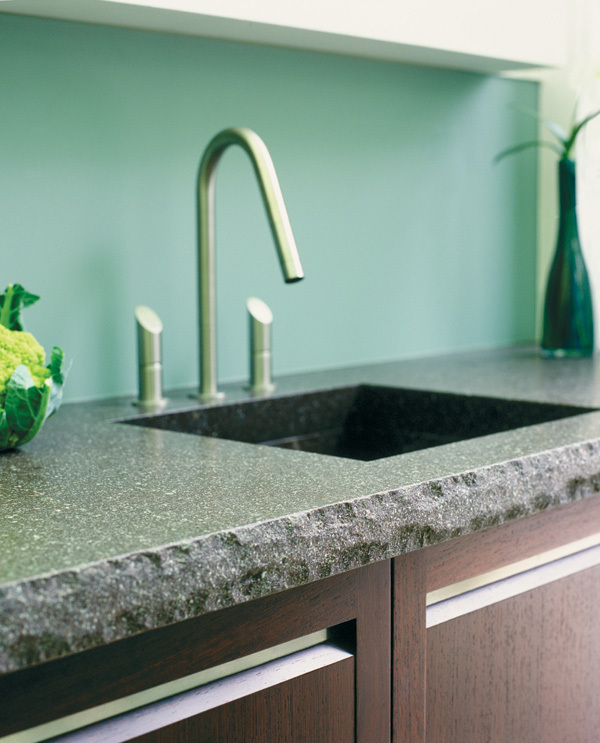 “Granite is also hygienic and easy to clean,” adds Jeremy. “We advise wiping away any spills as you go, but our tops are sealed with a very effective hydrophobic treatment, which makes it less porous and even easier to maintain.” Other suppliers include Stone Age and Stone Masters. Stone Age supplies all sorts of natural stone products including Black Basalt with a rough-hewn finish, priced from £336 per sq m. It also offers a range of stone flooring for a coordinated look. As an alternative to stone, there are a number of solid-surface, composite and quartz options available, which are a combination of natural stone with acrylic resin, creating an unlimited range of looks and colours. Quartz offers the same qualities as granite but with a consistency in colour, and whereas granite is 100% natural, manmade quartz stone is 93% natural. Zodiaq is one brand of engineered quartz that is extremely durable. It won’t chip or scratch easily and maintenance is simple – just wipe with a general household cleaner and warm cloth. 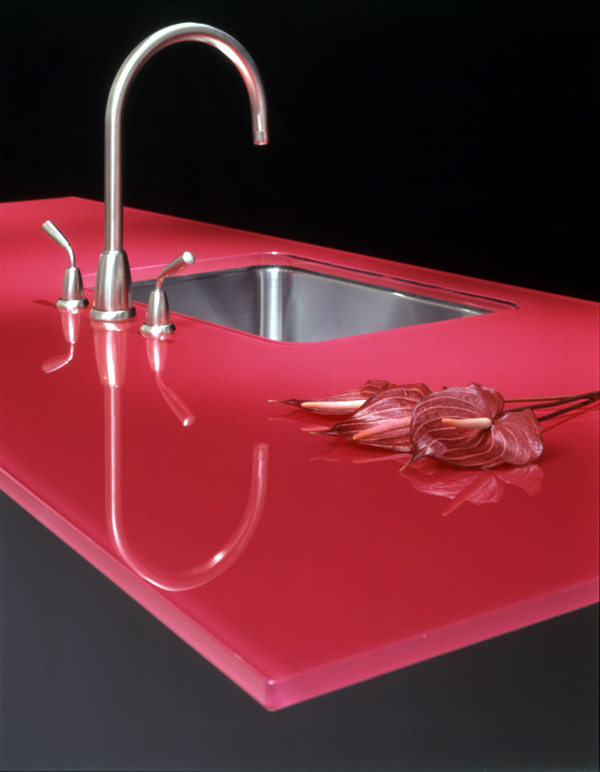 Corian by DuPont is the original solid surface. Stain-resistant, hygienic, easy to clean, durable and renewable, it’s available in over 50 colours and can be shaped into virtually any design with seamless joins and integrated sinks and splashbacks. It can scratch with heavy use, so again use chopping boards and trivets, but minor scratches can be sanded out as the colour runs through the worktop. Silestone is made from over 90% natural quartz and has built-in antibacterial protection, while other options include Hi-Macs – a composition of acrylic, natural minerals and pigments – and Bushboard’s Encore range, which offers a more affordable alternative as this pre-fabricated product has a 5mm layer of acrylic solid surfacing on top of 35mm high-density particle board. Hi-Macs by LG Hausys is a composition of acrylic, natural minerals and pigments, which makes for a a smooth, non-porous and visually seamless surface that is hygienic, easy to clean and can incorporate integrated splashbacks and sinks. It starts at £300 per linear m.
Timber adds warmth and character to the kitchen but does require more maintenance than other materials because it needs to be regularly oiled to keep it water-resistant. Danish oil is best and you can do the droplet test to check when it needs re-oiling. Simply drop a little water on the surface and if it forms a bead, it’s okay; if it spreads, it needs another coat. “Wood is perfect for complementing other finishes and materials,” says Graeme Smith of Second Nature. “Lighter timbers such as maple or bamboo are quite neutral and understated, whereas striking species such as walnut and zebrano will add more drama to your scheme.” Consider mixing an exotic species with stainless steel or glass in a modern scheme or natural oak with painted units for a timeless feel. Different timbers come in at different price points with rubberwood, beech and bamboo at the lower end, oak, cherry and iroko in the middle, and walnut and wenge at the top. You can expect to pay from around £94 per linear metre depending on the wood. Solid wood worktops are also incredibly durable and look better with age. There’s no top layer to worry about chipping, you can sand any marks out and if you use a good-quality hard wax oil finish, it will be water-repellent and heat-resistant. Most timbers are also naturally antibacterial. Other suppliers include Broadleaf Timber, Wren Kitchens and Fired Earth. These worktops have advanced greatly in terms of quality and durability in recent years and they are perfect for recreating the look of stone or wood for a fraction of the cost; prices start from as little as £45 per linear metre. “Laminate is the most flexible, functional and affordable material,” says Stuart White of Bushboard, “with the ability to reinvent itself and respond to fashion trends far more quickly than any other product. With an extensive choice of realistic designs, colours and surface textures, it’s ideal for any kitchen style.” Laminate can withstand knocks, abrasions, chemicals, steam and stains and is resistant to heat, although you should always use protective pads for hot pans and chopping. “It’s also the easiest to look after,” adds Stuart. “A simple wipe down with a moist cloth and your favourite mild detergent is all that’s required.” You can also find laminate worktops at Formica, Howdens and DIY stores. 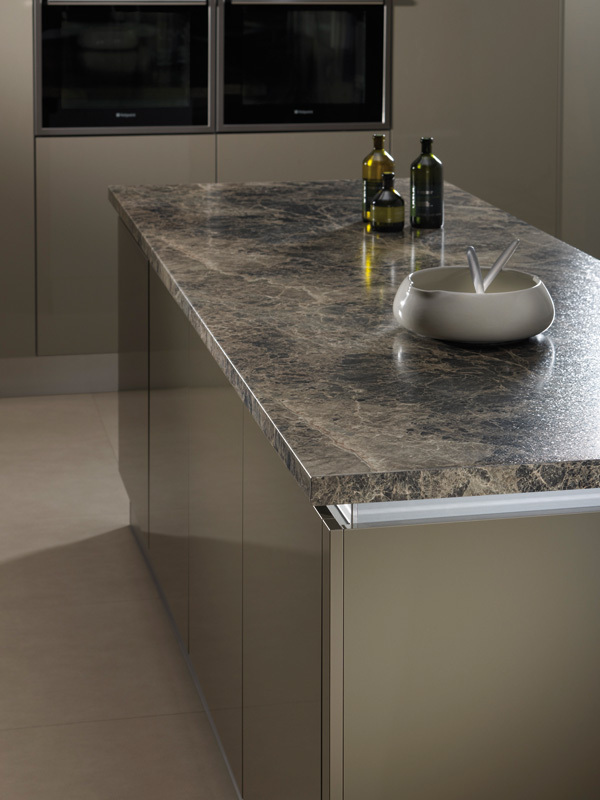 Breccia Paradiso laminate from Bushboard’s Prima range features true scale printing that mirrors the luxurious look of top-end granite for a fraction of the price at just £50 per linear m. It comes in a choice of sizes for worktops, breakfast bars, upstands and splashbacks. With prices from around £900 per linear metre, glass worktops are durable but, like stone, can chip if something heavy is dropped on an edge. It does scratch easily too, but is quick to clean with warm soapy water. For a brilliant shine, finish with window cleaner using soft paper or an E-cloth. You can place hot pans on toughened glass without fear of it cracking, but take care not to drag items across the surface. Glass Logic and UrbnRok by Glasseco provide made-to-measure tops. Perfect for contemporary kitchens and creating the illusion of space thanks to its light-reflective qualities, glass worktops are available in a huge range of colours with prices from £900 per linear m at Roundhouse Design. 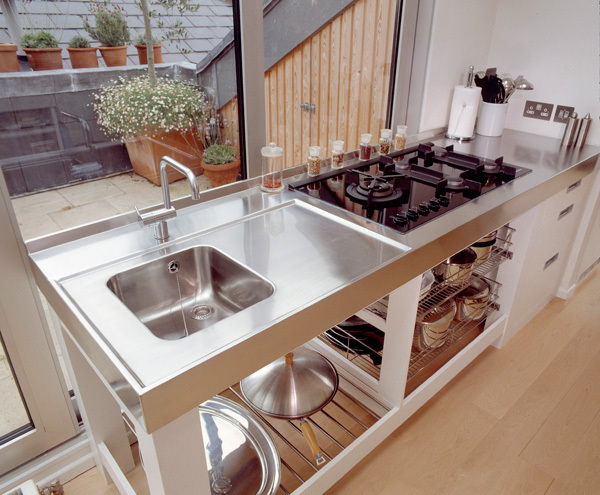 Barazza, Mette and GEC Anderson all supply stainless-steel work surfaces. These can be formed in one piece without joins or sections and can be used for L-shapes and irregular sizes with integral sinks and upstands. Steel is one of the most durable materials, which is why it’s the worktop of choice in professional kitchens. It can withstand hot pans and direct chopping, it’s hygienic as there’s no colour or veneer, and it’s non-chip and non-combustible too. Prices start at around £600 per metre and the great thing about them is that they look better with age. GEC Anderson’s bespoke stainless-steel worktops are formed in one piece without joins or sections and can include “L” shapes and irregular sizes. 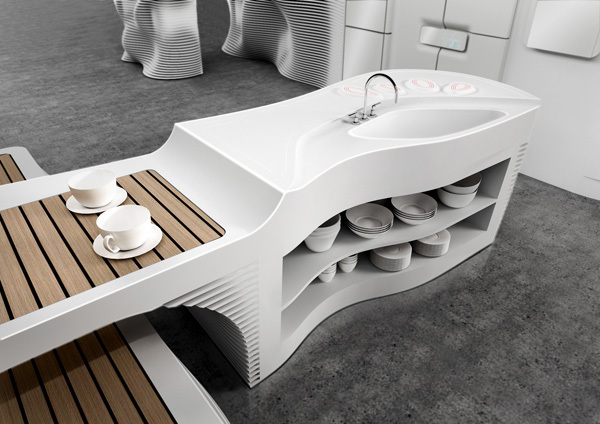 You can also have sinks integrated into the design and prices start at £600 per m.